The 1988 Polish strikes were a massive wave of workers' strikes which broke out in 1988 in the Polish People's Republic. The strikes, as well as street demonstrations, continued throughout spring and summer, ending in early September 1988. These actions shook the Communist regime of the country to such an extent that it was forced to begin talking about recognising Solidarity. As a result, later that year, the regime decided to negotiate with the opposition, which opened way for the 1989 Round Table Agreement. The second, much bigger wave of strikes (August 1988) surprised both the government, and top leaders of Solidarity, who were not expecting actions of such intensity. These strikes were mostly organized by local activists, who had no idea that their leaders from Warsaw had already started secret negotiations with the Communists. Late 1980s was the time of deep economic crisis of Poland. The military regime of General Wojciech Jaruzelski did not carry out any radical reform of the economy in 1982-1983 following their imposition of Martial Law in Poland. Industrial production remained below the 1979 level. Average inflation rate climbed to 60% by 1988, and Poland’s hard-currency debt to the Western countries grew from $25 billion in 1981 to $43 billion in 1989. Furthermore, the military rule was a failure, even though Solidarity had been outlawed in 1982, which in turn forced its members to go underground. In those circumstances, anger and frustration of the nation grew, deepened by economic malaise, and constantly declining living standards. More than 60% of population lived in poverty, and inflation, measured by black-market rate of the U.S. dollar, was 1,500% in the period 1982 - 1987. On November 29, 1987, the Communists decided to seek popular support for a 110% price increase, calling the Referendum on political and economic reforms (see Referendums in Poland) supported by the old slogan of "democratization" as the only concession. The government of Zbigniew Messner lost the referendum - according to independent sources, with the turnout of around 30%, but officially, it was announced that 63.8% voters participated in it, and so, deputy prime minister Zdzisław Sadowski decided to go on with the price increase. The policy was introduced on February 1, 1988. It was the biggest hike since 1982. The operation was a failure, as the massive price increases were followed by 40% increase in wages, meant to offset the price increases. As a result, inflation rose at alarming speed, and by late 1989, near hyperinflation was reached. In late 1987, Communist authorities initiated a wave of repressions of activists of underground Solidarity trade union and other oppositional organizations. On November 9, Kornel Morawiecki, leader of Fighting Solidarity was arrested. In the same year, Lech Wałęsa resumed his post as leader of Solidarity, where he remained until 1990. Meanwhile, local branches of the movement tried to legalize themselves in courts across Poland, but all these attempts were refused. On August 31, 1987, the 7th anniversary of the Gdańsk Agreement, street demonstrations and clashes with police took place in Warsaw, Wrocław, Lublin, and Bydgoszcz. On March 8, 1988, on the 20th anniversary of the 1968 Polish political crisis, activists of the Independent Students Union organized demonstrations in Warsaw, Kraków and Lublin. Most active demonstrators were immediately repressed by the government. On April 21, 1988, 5000 workers of Stalowa Wola Steelworks organized a meeting, during which they demanded end of repressions of Solidarity activists, and 20,000 złoty salary increase. The first strikes broke out four days later, on April 25, 1988, in mass transportation centers in northern cities of Bydgoszcz and Inowrocław. On the next day, one of the biggest companies of the country, Vladimir Lenin Steelworks in Kraków, joined the strike. The workers demanded salary increase, re-employment of Solidarity activists, who had been fired during the martial law, as well as legalization of Solidarity. Meanwhile, a strike broke out in Stalowa Wola Steelworks. Both these actions were suppressed by the Communist security forces (ZOMO), supported by anti-terrorist units. In Stalowa Wola, a demonstration of force, together with threats of use of regular army troops, was sufficient, and the strikers gave up on April 30. In Kraków, however, the workers continued their action, therefore the government decided to use power. In the night of May 4/5, the steelworks were brutally pacified by the ZOMO and anti-terrorist units. In reaction to the attack, workers of several factories across the country organized protests and meetings. On May 1, 1988, opposition activists organized peaceful demonstrations in several Polish cities, such as Bielsko-Biała, Dąbrowa Górnicza, Gdańsk, Kraków, Łódź, Płock, Poznań, Warsaw, and Wrocław. They were attended by thousands of people, and in some places, street fights erupted. On the next day, a strike broke out in Lenin Gdańsk Shipyard, where workers demanded legalization of Solidarity. Soon, Tadeusz Mazowiecki and Andrzej Wielowieyski showed up in Gdańsk, ready to talk to the management of the plant. However, the talks were fruitless, and on May 10, after threats of use of force, the strike ended in the atmosphere of failure. The last strike of the spring took place in Szczecin, involving workers of city’s mass transit system. During late spring and early summer of 1988, the situation in Poland did not improve. In several cities, local Solidarity branches unsuccessfully tried to legalize the union. On June 19, local elections took place, and Solidarity urged voters to boycott them. On July 26, government spokesman Jerzy Urban said that Solidarity permanently belonged to the past, and two days later, Polish sociologists announced that only 28% of Poles believed that government’s reforms would succeed. Most people thought that the reforms would end up with even deeper crisis. The first strike of summer 1988 took place in the Upper Silesian city of Jastrzębie-Zdrój, and it began on August 15. On August 15, a strike broke out at the July Manifesto coal mine in Jastrzębie-Zdrój; the mine had been a center of strikes eight years earlier (see Jastrzębie-Zdrój 1980 strikes). Importantly, miners from July Manifesto tried to start a strike on May 15, 1988, but the main activists of Solidarity had been arrested by the Służba Bezpieczeństwa, whose special agents got word of the plans. In the second half of August, further mines, most from southern Upper Silesia joined the strikers, and the Interfactory Strike Committee under Krzysztof Zakrzewski was founded in Jastrzębie-Zdrój. Miners from Jastrzębie-Zdrój were supported by a local priest, reverend Bernard Czernecki. Communist secret services, as well as conformist Solidarity leaders, were completely surprised by the strikes in Upper Silesia. In a report dated August 14, 1988, special agents of Służba Bezpieczeństwa wrote: “According to our sources, opposition leaders are not planning anything”. Later, some of the strikes were broken by the Milicja Obywatelska special, antiriot detachments - at Morcinek coalmine in Kaczyce (August 24), Lenin in Myslowice, and Andaluzja in Piekary. Almost all strikes took place in mines, whose employees were people transferred from other areas of Poland in the 1970s. Mines in “traditional” parts of Upper Silesia did not join the protestors, except for Andaluzja from Piekary Slaskie, and Lenin from Myslowice. On September 2, Lech Wałęsa appeared in the July Manifesto coalmine, the last place that continued the strike. After his appeal, and a long argument, the miners decided to give up. The strike at July Manifesto was the longest one of Communist Poland. On August 17, the Port of Szczecin began to strike. In the following days, other companies from Szczecin stopped working, and the Interfactory Strike Committee was founded. It issued a statement, which consisted of four points, one of which was the demand of legalization of Solidarity. On August 28, the Committee announced that Wałęsa was its sole representative. In response, Wałęsa sent to Szczecin a statement about his meeting with Czesław Kiszczak, during which the future Round Table talks had been discussed. Nevertheless, the strikes in Szczecin did not end until September 3. Wałęsa had informed the public about talks with the regime during the August 21 demonstration in Gdańsk. By far the biggest strike of summer 1988 took place in Stalowa Wola Steelworks, in which around 10,000 workers participated, and the plant was surrounded by militarized police units. The Stalowa Wola strike was so significant, that it was dubbed “the fourth nail in the coffin of Communism”. Since the Steelworks was an arms manufacturer, the factory, which in the 1980s employed around 21,000 people, was under a watchful eye of the security services, and its employees were strictly prohibited from undertaking any kind of oppositional activities. 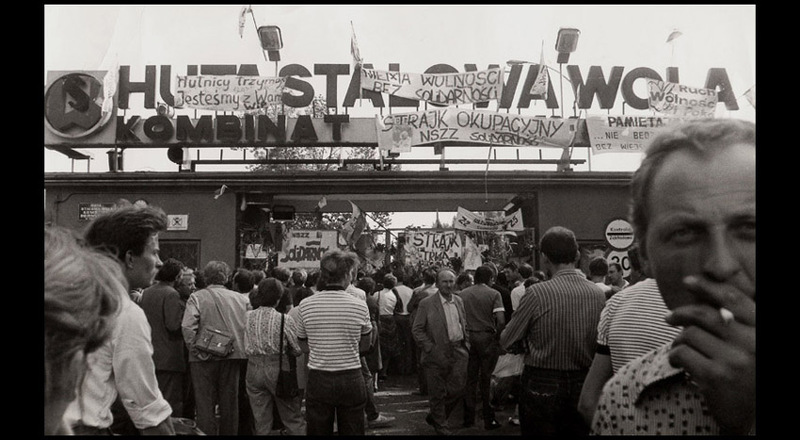 Nevertheless, across the 1980s, it was one of main centers of protests and demonstrations, and in spring of 1988, Stalowa Wola workers started the first strike of that year, which ended after a few days, and which was a prelude of the summer events. On August 22 in the morning, workers of the plant decided to organize a sit-in, with only one demand - legalization of Solidarity. This decision was crucial for further events in Poland, as strikes in Upper Silesia were slowly coming to an end. Led by Wieslaw Wojtas, the strike lasted 11 days. Workers were supported by local priests, and activists of the so-called Supporting Office, who delivered food, medicine, blankets, helped those beaten by government security forces, but also informed Western Europe about situation in Stalowa Wola. Every day, citizens of the town gathered by the Gate 3 to the steelworks, where local parish priest, reverend Edmund Frankowski, celebrated two masses (August 26, and 31), which were attended by up to 10,000 people. Frankowski actively supported the strikers, in the sermons, he urged the faithful to help the workers. The Stalowa Wola strike ended on September 1, after the personal request of Lech Wałęsa, who called Wiesław Wojtas, telling him: “You are great, but please, end the strike, I am asking you in the name of Solidarity”. Following Wałęsa's request, 4,000 workers left the factory on September 1, at 7 p.m. Together with around 15,000 inhabitants of the city, they marched to the Church of Mary, Queen of Poland, where they were greeted by reverend Frankowski, who said: “Illegal priest is welcoming participants of the illegal strike”. On August 19, a group of young activists began circulating leaflets, urging workers of the Gdańsk Lenin Shipyard to join striking miners from Jastrzębie-Zdrój. According to Alojzy Szablewski, who was leader of plant’s Solidarity, Lech Wałęsa was called, and during a meeting it was decided the strike would begin on Monday, August 22. On that day, at 7 a.m., some 3000 workers put away their tools. Their only demand was short - legalization of Solidarity. Soon afterwards, other main factories of Gdańsk joined the shipyard - Port Polnocny, Stocznia Polnocna, Stocznia Remontowa. Interfactory Strike Committee was founded, led by Jacek Merkel, and workers were supported by a number of personalities, such as Jacek Kuroń, Adam Michnik, Lech Kaczyński, and his twin brother Jarosław Kaczyński. Unlike in August 1980, the 1988 strike was different, as the government lacked power to force the strikers to give up. Furthermore, Gdańsk Lenin Shipyard was visited by a number of guests from abroad, including Boston Mayor Ray Flynn, in whose presence the use of force was not likely. The events in Gdańsk were described by Padraic Kenney as truly Orange Alternative strike. Workers of the Gdańsk Repair Shipyard mocked secret service and police agents, by making a styrofoam tank with the slogan: Leave your arms at the gate, we want dialogue. The strikes in Gdańsk ended on September 1, and on September 3, both sides signed an agreement, according to which the communists promised not to persecute the strikers. The promise was broken, and hundreds of people were fired in the fall of 1988. At first, the government tried to threaten the protestors; on August 20, the Committee of National Defence announced preparations for introduction of national state of emergency. However, the determination of the workers made the Communists realize that talks with the officially non-existent trade union were inevitable. On August 31, General Czesław Kiszczak met with Lech Wałęsa. During the conversation, which was witnessed by Archbishop Bronisław Wacław Dąbrowski, Kiszczak appealed for putting an end to strikes, he also promised to take care of legalisation of Solidarity. Even though Solidarity activists in several centers opposed Wałęsa's appeal to end strikes, soon afterwards laborers returned to work. The last strikes, in the Port of Szczecin and the July Manifesto coal mine, lasted until September 3. On December 18, Wałęsa established the Solidarity Citizens' Committee, which opened way for the Polish Round Table Agreement. In 1988, director Andrzej Piekutowski made a documentary film Coal Miners’88, which presents strike in July Manifesto coal mine. Also, Pawel Smolenski and Wojciech Gielzynski wrote a book Workers’88. ^ "History of Solidarity, 1987". Archived from the original on 2009-07-09. Retrieved 2009-06-10. ^ a b "History of Solidarity, 1988". Archived from the original on 2007-02-27. Retrieved 2009-06-10. ^ "Nowa Huta. Miasto pracy i walki". Archived from the original on 2009-06-01. Retrieved 2009-06-10. ^ The Washington Post, "Polish Unrest Spreads; Dozens of Activists Held; Workers at 2nd Industrial Center Join Protest"
^ "20th Anniversary of Stalowa Wola strikes". Archived from the original on 2011-07-21. Retrieved 2009-06-10. ^ a b "Strike in Stalowa Wola Steelworks, August 22 - September 1, 1988". Archived from the original on 2009-02-20. Retrieved 2009-06-10. ^ Gazeta Wyborcza, "Anniversary of August 1988"
^ "Solidarity - History in dates". Archived from the original on 2009-10-02. Retrieved 2009-06-10. ^ "Film Library By Director". Archived from the original on 2009-05-22. Retrieved 2009-06-10. ^ "Polska historia 1976 - 1989 - wydawnictwa zagraniczne". incipit.home.pl. Retrieved 2019-01-16. The 1982 demonstrations in Poland refers to anti-government street demonstrations organized by underground Solidarity to commemorate the second anniversary of the Gdańsk Agreement. The bloodiest protest occurred in southwestern Poland, in the town of Lubin, on August 31, 1982. The Lubin demonstration resulted in three protesters killed by Communist services, and an unknown number of wounded. On the same day, rallies and demonstrations took place in several cities across the country. According to Solidarity sources, there were four more victims—in Wrocław, Gdańsk, Nowa Huta, and Toruń. According to official government sources, there were demonstrations in 66 cities. A referendum on political and economic reforms was held by Poland's communist regime on 29 November 1987. The government's aim in holding the referendum was to obtain a mandate for difficult economic and political reforms. Around a third of eligible voters did not participate, defying the regime. Only 44% of Poland's 26 million eligible voters voted yes to the question on economic reform, and 46% voted yes to the second question on "democratisation" in Poland. Even though a majority of the votes cast supported the propositions, according to the rules of the referendum the majority of eligible voters had to vote yes in order for the referendum to pass. The resulting failure of the referendum was unprecedented, as it was the first time that Communist authorities in Eastern Europe had lost a vote. The ASEAN Declaration or Bangkok Declaration is the founding document of Association of Southeast Asian Nations (ASEAN). It was signed in Bangkok on 8 August 1967 by the five ASEAN founding members, Indonesia, Malaysia, Philippines, Singapore, and Thailand as a display of solidarity against communist expansion in Vietnam and communist insurgency within their own borders. It states the basic principles of ASEAN: co-operation, amity, and non-interference. The date is now celebrated as ASEAN Day. The Guerrilla war in the Baltic states or the Forest Brothers resistance movement was the armed struggle against Soviet rule that spanned from 1940 to the mid-1950s. After the occupation of the Baltic territories by the Soviets in 1944, an insurgency started. According to some estimates, 10,000 partisans in Estonia, 10,000 partisans in Latvia and 30,000 partisans in Lithuania and many more supporters were involved. This war continued as an organised struggle until 1956 when the superiority of the Soviet military caused the native population to adopt other forms of resistance. While estimates related to the extent of partisan movement vary, but there seems to be a consensus among researchers that by international standards, the Baltic guerrilla movements were extensive. Proportionally, the partisan movement in the post-war Baltic states was of a similar size as the Viet Cong movement in South Vietnam. Huta Stalowa Wola (HSW SA) is a defense contractor, and steel mill. It is a major producer of military equipment in Poland, located in Stalowa Wola. The Jamaican political conflict is a long standing feud between right-wing and left-wing elements in the country, often exploding into violence. The Jamaican Labor Party and the People's National Party have fought for control of the island for years and the rivalry has encouraged urban warfare in Kingston. Each side believes the other to be controlled by foreign elements, the JLP is said to be backed by the American Central Intelligence Agency and the PNP is said to been backed by the Soviet Union and Fidel Castro. The Jastrzębie-Zdrój 1980 strikes were widespread strikes, which took place mostly in the Upper Silesian mining city of Jastrzębie-Zdrój and its surroundings, in late August and early September 1980. They forced the Government of People's Republic of Poland to sign the last of three agreements establishing the Solidarity trade union. Earlier, agreements had been signed in Gdańsk and Szczecin. The Jastrzębie Agreement, signed on September 3, 1980, ended Saturday and Sunday work for miners, a concession that Government leaders later said cut deeply into Poland's export earnings. The Johnson Doctrine, enunciated by U.S. President Lyndon B. Johnson after the United States' intervention in the Dominican Republic in 1965, declared that domestic revolution in the Western Hemisphere would no longer be a local matter when "the object is the establishment of a Communist dictatorship". It is an extension of the Eisenhower and Kennedy Doctrines. The term Kniefall von Warschau, also referred to as Warschauer Kniefall, (both German for "Warsaw genuflection") refers to a gesture of humility and penance by German Chancellor Willy Brandt towards the victims of the Warsaw Ghetto Uprising. The PAX Association (Polish: Stowarzyszenie PAX) was a pro-communist Catholic organization created in 1947 in the People's Republic of Poland at the onset of the Stalinist period. The association published the Słowo Powszechne daily for almost fifty years between 1947 and 1993 with an average of 312 issues annually.The first editor-in-chief of Słowo Powszechne (circulation: 40,000) was Wojciech Kętrzyński (d. 1983) from KN, grandson of historian Wojciech Kętrzyński. In 1982 the newspaper adjusted its name to Słowo Powszechne: dziennik Stowarzyszenia PAX (the "PAX Association Daily"). The publication closed only when the PAX ceased to function in 1993, following the collapse of communism; however, the facsimile of the association was reestablished in 1993 under a different name: the Catholic association "Civitas Christiana".Notably, in 1953 the PAX gave its support to the Stalinist show trial of the Kraków Curia pronouncing death penalties for the Catholic priests accused of treason, and took over the publication of the Catholic weekly magazine Tygodnik Powszechny until the Polish October of 1956. The Pacification of Wujek was a strike-breaking action by the Polish police and army at the Wujek Coal Mine in Katowice, Poland, culminating in the massacre of nine striking miners on December 16, 1981. It was part of a large-scale action aimed to break the Solidarity free trade union after the introduction of martial law in Poland in 1981. Although the strike was suppressed, in a longer term, it turned out to be a milestone towards the collapse of the authoritarian system in Poland and, ultimately, to the collapse of the Eastern Bloc. It was a site of numerous protests, including by Solidarity activist Anna Walentynowicz who commemorated a plaque to the murdered miners shortly after she left prison at Gołdap. Paweł Bogdan Adamowicz ([ˈpavɛw ˈbɔɡdan adaˈmɔvʲit͡ʂ], 2 November 1965 – 14 January 2019) was a Polish politician and lawyer who served as Mayor of the city of Gdańsk, Pomeranian Voivodeship, from 1998 until his assassination in 2019.Adamowicz was one of the organizers of the 1988 Polish strikes before becoming the head of the strike committee. In 1990, he was elected to the Gdańsk City Council, chairing the body from 1994 during his second term and holding this post until 1998. He was elected Mayor of Gdańsk in 1998 and reelected in 2002 with 72% of the vote. In 2018, he was reelected as an Independent. He was known as a liberal, progressive figure, speaking in support of LGBT rights, immigration, and minority groups such as Kashubians.On 13 January 2019, Adamowicz was stabbed during a live charity event in Gdańsk by a former inmate, who had been released from prison a month prior to the assassination. Adamowicz died the following day from his injuries, at the age of 53. The Polish People's Army (Ludowe Wojsko Polskie pronounced [luˈdɔvɛ ˈvɔi̯skɔ ˈpɔlskʲɛ], LWP) constituted the second formation of the Polish Armed Forces in the East in 1943–1945, and in 1945–1989 the armed forces of the Polish communist government of Poland (from 1952, the Polish People's Republic). The communist-led Polish armed forces, allowed and facilitated by Joseph Stalin, were the result of efforts made in the early 1940s by Wanda Wasilewska and Zygmunt Berling. The official name of those formations were: Armia Polska w ZSRR (Polish Army in the USSR) from 1943–1944, Wojsko Polskie (Polish Troops) and Siły Zbrojne Rzeczpospolitej Polskiej (Armed Forces of the Republic of Poland) from 1944–1952 and from 1952 Siły Zbrojne Polskiej Rzeczypospolitej Ludowej (Armed Forces of the Polish People's Republic). Repatriation of Polish population in the years of 1955–1959 (also known as the second repatriation, to distinguish it from the first repatriation in the years 1944-1946) was the second wave of forced repatriation (in fact, deportation) of the Poles living in the territories annexed by the Soviet Union (see Kresy Wschodnie). It should be stressed that the widely used term repatriation, promoted by decades of Polish communist propaganda, is a kind of manipulation and refers to an act of illegal expatriation. Six-Year Plan (1950–1955) was the second - after the Three-Year Plan (1947–1949) - centralized plan of the People's Republic of Poland. It concentrated on increasing the heavy industry sector. By 1950 the Polish government was dominated by Stalinist hardliners, such as Hilary Minc, and liberal economists responsible for creation of the Three-Year Plan were no longer influencing government policy. The Six-Year Plan, designed to bring the economy of Poland in line with the Soviet economy, concentrated on heavy industrialization, with projects such as Nowa Huta. The plan was accepted by the Sejm on July 21, 1950. Later on, it was modified several times, and never fully completed. Polish society paid a heavy price for badly thought-out and quick industrialization. Living standards were reduced, since investments in other fields, such as construction, were cut. In agriculture, the idea of collectivization was promoted, to the protests of Polish farmers. The plan was fashioned after similar Soviet plans, and was based on certain Soviet-style principles, such as central planning of economy, limiting the so-called Capitalist elements, and close cooperation with other Eastern Bloc nations. New urban districts were built in big cities, attracting residents of overpopulated villages. At the same time, however, the balance between supply and demand deepened, and shortages of basic products were common. As a result, rationing was re-introduced in the early 1950s. development of Szczecin Shipyard (formerly AG Vulcan Stettin). Small Constitution of 1947 (Polish: Mała Konstytucja z 1947) was a temporary constitution issued by the communist-dominated Sejm (Polish parliament) of 1947–1952. It confirmed the practice of separation of powers and strengthened the Sejm. It was renewed in 1949, 1950 and 1951. It recognized some articles of the previous March Constitution of Poland (1921) and PKWN Manifesto (1944), whereas the Constitution of 1935 was declared null and void as fascist. It was replaced in 1952 by the Constitution of the Polish People's Republic. Solidarity (Polish: Solidarność, pronounced [sɔlʲiˈdarnɔɕt͡ɕ] (listen); full name: Independent Self-governing Labour Union "Solidarity"—Niezależny Samorządny Związek Zawodowy "Solidarność" [ɲezaˈlɛʐnɨ samɔˈʐɔndnɨ ˈzvʲɔ̃zɛk zavɔˈdɔvɨ sɔlʲiˈdarnɔɕt͡ɕ]) is a Polish labour union that was founded on 17 September 1980 at the Lenin Shipyard in Gdańsk under the leadership of Lech Wałęsa. It was the first trade union in a Warsaw Pact country that was not controlled by a communist party. Its membership peaked at 10 million members at its September 1981 Congress, which constituted one third of the total working-age population of Poland.In the 1980s, Solidarity was a broad anti-bureaucratic social movement, using the methods of civil resistance to advance the causes of workers' rights and social change. The government attempted to destroy the union by imposing martial law in Poland, which lasted from December 1981 to July 1983 and was followed by several years of political repression from 8 October 1982, but in the end it was forced to negotiate with Solidarity. In the union's clandestine years, Pope John Paul II and the United States provided significant financial support, estimated to be as much as 50 million US dollars.The round table talks between the government and the Solidarity-led opposition led to semi-free elections in 1989. By the end of August, a Solidarity-led coalition government was formed. In December 1990, Wałęsa was elected President of Poland. Since then, Solidarity has become a more traditional liberal trade union. Its membership had dropped to 680,000 by 2010 and 400,000 by 2011. The Ulbricht Doctrine, named after East German leader Walter Ulbricht, was the assertion that normal diplomatic relations between East Germany and West Germany could occur only if both states fully recognised each other's sovereignty. That contrasted with the Hallstein Doctrine, a West German policy which insisted that West Germany was the only legitimate German state. East Germany gained acceptance of its view from fellow Communist states, such as Czechoslovakia, Poland, Hungary, and Bulgaria, which all agreed not to normalise relations with West Germany until it recognised East German sovereignty. West Germany eventually abandoned its Hallstein Doctrine, instead adopting the policies of Ostpolitik. In December 1972, a Basic Treaty between East and West Germany was signed that reaffirmed two German states as separate entities. The treaty also allowed the exchange of diplomatic missions and the entry of both German states to the United Nations as full members. The Western Bloc during the Cold War refers to capitalist countries under the hegemony of the United States and NATO against the Soviet Union and the Warsaw Pact. The latter were referred to as the Eastern Bloc. The governments and press of the Western Bloc were more inclined to refer to themselves as the "Free World" or the "Western world", whereas the Eastern Bloc was often called the "Communist world or Second world".